Damage Locations always follow the same pattern: Front to back, top to bottom, left to right (as seen from driver's seat), in an "S" pattern, with locations for door handles and mirrors. Codes are location, damage, and hours. Example: "2D1" is a one hour dent in location 2. There may be a primary and secondary code per part, as in "2D1,4S2." If there is no damage on a part the code is 000 (as three zeros). 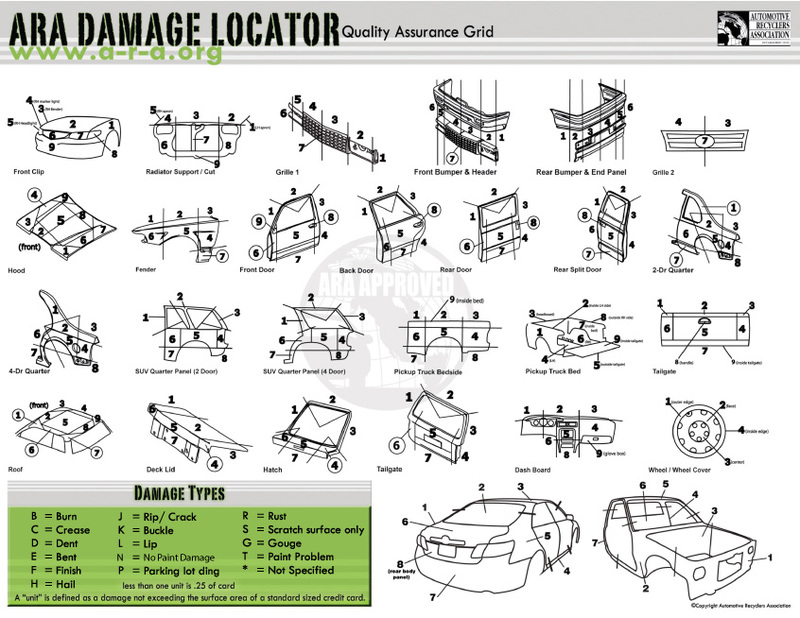 Zero as a location indicates the entire panel, as in 0H4 (all over hail damage, 4 hours). © Copyright 2013-2019 Bill's Used Parts, Inc.